In a city with as much history as London, it is not surprising that its buildings have lived many different lives. What is perhaps surprising is the creative use that contemporary artists have made of disused buildings. An abandoned tube station (Brompton Road in Knightsbridge) recently went on the market and we're interested to see what an innovative buyer will make of it. After all, the recent closure of the Old Vic Tunnels arts venue, located in unused railway vaults beneath Waterloo Station, has left a tube/arts gap that we'd like to see filled. In the meantime, here are a few of London's most interesting arts venues that were originally built for very different purposes. One of London’s most famous attractions, and one of the most visited museums in the world, the Tate Modern occupies the former Bankside Power Station on the South Bank of the River Thames. The power station was designed by Sir Giles Gilbert Scott, who was also responsible for many classic red telephone box designs, and was on its way to being demolished when the Tate Gallery announced it as the home for its new modern art museum. The Tate’s Turbine Hall used to hold the power station’s operators and now displays specially commissioned works by artists that have included Louise Bourgeois and Olafur Eliasson (above); as well a 2013 performance by Kraftwerk, which was so hotly anticipated that it crashed the museum’s booking system. 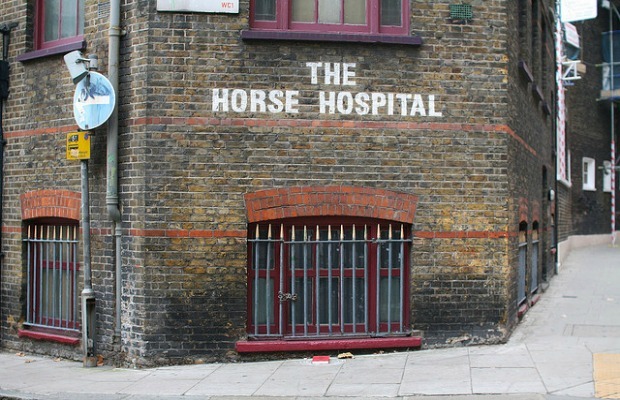 Situated in the heart of Bloomsbury, the Horse Hospital was built in the 1797 as an equine sanatorium and retains several of its original features, such as iron tethering rings, a mock-cobbled concrete floor, and a wooden slatted ramp, which was designed to prevent horses from slipping. The arts center currently occupying the two-floor stable opened in 1993 with a retrospective of Vivienne Westwood’s punk designs. Over the past 20 years, the Horse Hospital has remained true to its mission of providing a space for progressive, risky, and non-conformist art, film, fashion, literature, and music. The venue hosts a wide range of outsider exhibitions and events; past programs have included the work of Alejandro Jodorowsky, Lydia Lunch, and Shepard Fairey. 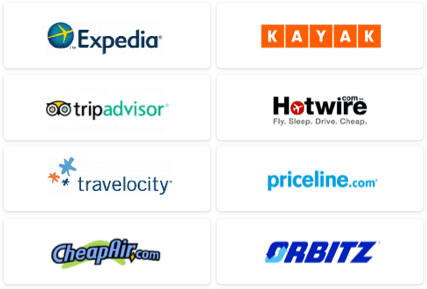 Entrance is always low-priced and often free. The great British institution, the working men’s club, was created in the 19th century to provide working-class families with a place to socialize and, ostensibly, further their educations. The clubs, which in practice are largely recreational, feature bars and nighttime entertainment in the form of live music and bingo. Nowadays, however, the clubs are facing a declining membership, and most have been forced to close. 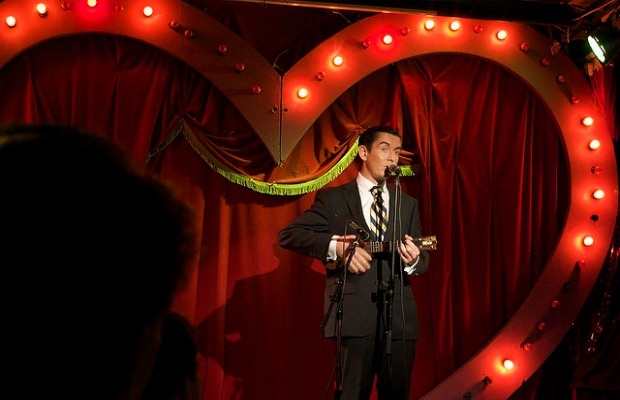 One WMC that is still going strong is Bethnal Green Working Men’s Club, which, since 2001 has opened the doors of its modest, old-timey club to the public and hosted burlesque shows and dance parties. The only noticeable renovation is the giant red glittery heart behind the little stage. The building housing this off-West End theater began life as a Menier Chocolate Company Factory in the 1870s and stood vacant until the theater opened in 2004. The building still has the cast iron columns, exposed wooden beams, and brick masonry from its chocolate factory days, and is now home to an arts complex that includes a gallery and a restaurant, as well as the 150-seat theater. Past productions have included the Olivier Award-winning Sunday in the Park and La Cage aux Folles. 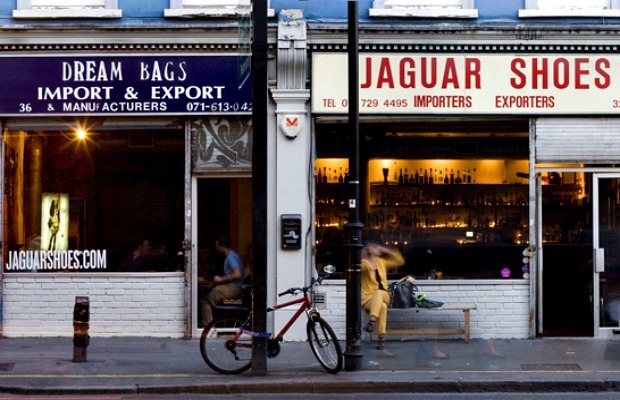 In the hip Shoreditch district, this bar and event space occupies two former wholesale outlets – the store signs remain out front, hence the name. The stripped-down interior looks as though almost no remodeling has taken place and serves as a blank canvas for events – ranging from art shows to exhibitions and fashion shows – curated by the artists' organization, JAGUARSHOES COLLECTIVE. 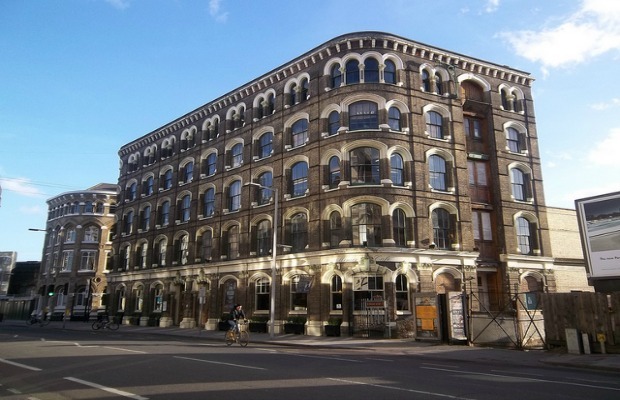 A renovated Victorian warehouse next to Shoreditch High Street Railway Station, which has, in previously lives, functioned as a coal store, music hall, and 18th century theater has, since 2007, hosted exhibitions, concerts, theater, and club nights in its current incarnation as Village Underground. 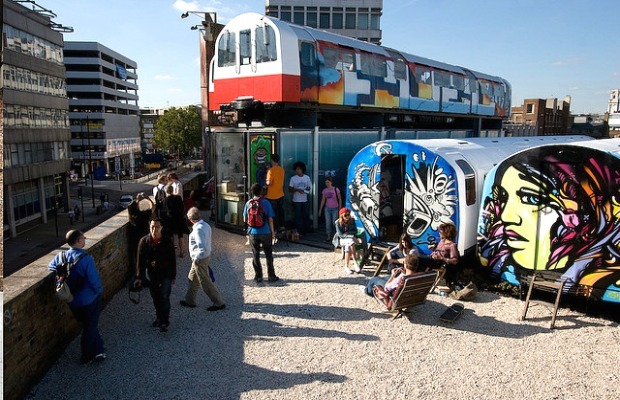 Above the main center, four brightly colored, tagged Jubilee Line subway carriages serves as artists’ studios for Village Underground's creative community.